Sing Your Life: Morrissey at the National Stadium, 1991. | Come Here To Me! « The Attack on New Books, 1956. Sing Your Life: Morrissey at the National Stadium, 1991. Evening Herald, 29 April 1991. Morrissey’s father phoned the Gerry Ryan Show once in its early days to complain about the lack of airplay given to his son’s music on Irish radio. -Dermot Hayes writing in the Irish Press. 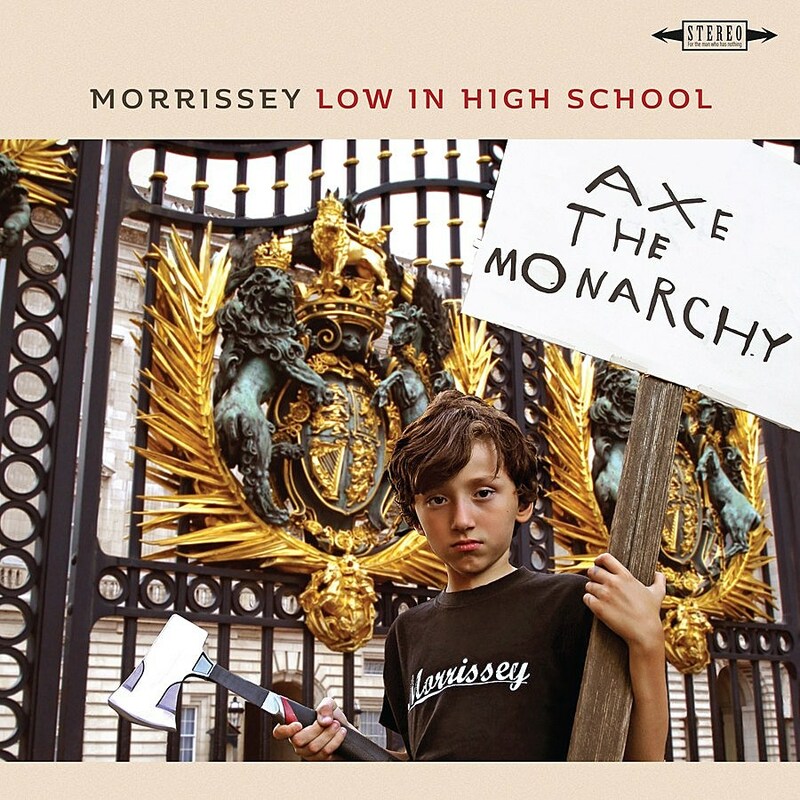 Friday sees the release of Morrissey’s new record, Low in High School. Its cover features a child holding an axe outside Buckingham Palace, clinging to a placard that says ‘Axe The Monarchy’. One would expect nothing less. His solo career has now produced a remarkable eleven albums, beginning with 1988’s Viva Hate. If you care, my favourite remains You Are The Quarry. Next February, Morrissey returns to Dublin to play the Point Depot, a venue we will never call by any other name. He is strongly bound to Dublin through blood, but also a passion for Irish literature, which included reference to Brendan Behan on his last recorded album. It’s an interesting part of the Morrissey story that his first proper solo concert was here in Dublin, with a sold-out concert at the National Stadium in April 1991. There had been a gig in December 1988 in Wolverhampton, but it was in many ways the remnants of The Smiths, and largely consisted of Smiths songs. Dublin was the beginning of the first ever Morrissey solo tour, backed by a new band and performing only his own songs. A negative review in the Evening Herald inspired full pages of letters from disgruntled fans over subsequent days, but for most who were there the concert was nothing short of a revelation, with tickets selling out in an impressive forty-seven minutes (before the internet). The Irish Press couldn’t quite get the appeal, asking just what was it about “the bard of bedsit psychoses” that appealed to Irish teenagers. It was all front page news the following day, viewed as nothing less than the latest youth culture craze in the eyes of curious journalists. Irish Press, 29 April 1991. To say Morrissey is idolised by his fans is an under-statement. They could not be kept off stage – although at times it looked as though even the narcissistic Morrissey was getting fed up with being kissed repeatedly on the ear. Dressed in jeans and a glittering lurex style v-necked vest, Morrissey, to the delight of a packed arena, spent much of the evening wrapping his arms around his own body, running his hands through his hair and letting his tongue shoot back and forward lizard-style. Notice the flower-covered stage! This image from the concert was later used by EMI Records. The set list included no Smiths numbers (it was far too early for that), but there was a cover of the New York Dolls song ‘Trash’, dedicated to the great Johnny Thunders who had died shortly before the concert. Despite what the Herald maintained, it seemed to everyone else that the man who would later describe himself as “ten parts Crumlin, and ten parts Old Trafford” was off to a flying start. A few months later he returned to the much larger Point Depot, his boxing stadium days behind him in Dublin for a while at least. Superb piece. I was at this show. One of my first gigs! …..but unfortunately Morrissey is a well known right winger with fascist and racist views! I was there. Remember walking back into the city through Wexford St. after the gig and hearing the Manic Street Preachers who were playing in JJ Synges. Seems like a lifetime ago!